Travel tips to make the best out of your trip to this beautiful part of China: local customs, food, and shopping. As Inner Mongolia is very big, this guide aims to introduce you to some of the region’s key sights and attractions to help you best plan your trip. If you would like more details about a particular place, please comment below. For more general information about traveling in China such as visas, vaccinations, flights, food etc. be sure to check out this epic 4,000 word complete guide to traveling in China. Just skip to the sections you are most interested in! The agency sorted out everything including my travel from Beijing: easy life! I made some really awesome friends on the tour. My biggest issue with the tour was how much time we had to spend in transport vs. how much time we actually got to see stuff. If you have limited time to travel to Inner Mongolia and limited time to organize your trip, booking through a tour agency may be a good choice. However, I recommend not booking a tour that is too ambitious with its itinerary or you will spend your entire trip on a bus… Inner Mongolia is a huge region! Some of the best tours I’ve experienced and heard great feedback about are those organized by Anda’s guesthouse. This family-run hostel offers a good variety of tours at one of the most cost effective prices in Hohhot. The staff and guides are very friendly and are also always happy to help you with your own travel plans. The second time I visited Inner Mongolia, I was determined to go beyond the beaten path and make my own way through the region as much as possible. I was not disappointed! I got to discover the Inner Mongolia of my imagination with lush rolling grasslands and sunsets over the desert. By this point, I could speak enough Mandarin to get by. If you are in a situation similar to the one above, I definitely recommend making your own way as much as possible. Inner Mongolians are very helpful and you should easily be able to convince a taxi driver to help you organize a homestay in a yurt or negotiate the bus system to get to the more remote parts of the region. Go north and go west! These parts of the region are more remote but boast some of the most beautiful scenic spots in China. Be warned that some areas of the far West region of Inner Mongolia require travel permits, meaning that using a local tour company to obtain these is inevitable. If you don’t speak Mandarin but still want to escape the tourist track do not despair! Friendly hostels in cities like Hohhot can help you plan and organize expeditions to more remote areas. You can also ask them to write down any Mandarin characters (for example asking for a bus ticket to a place) you might need on your travels. When it comes to cities in Inner Mongolia, perhaps this article says it best, describing the regions largest cities Hohhot – which by the way is the capital of the Province – and Baotou as having that ‘on-the-brink-of-something-big’ feel. That is to say they are not particularly beautiful cities but they have a certain excitement and charm, and business is booming! Although Inner Mongolia’s main charm comes from its natural scenery, the cities also hold some attractions well worth a visit. Dazhao temple: This colourful temple is Hohhot’s oldest temple built in the 16th century. It contains a 2.5m silver Sakyamuni Buddha statue and is worth the visit for those interested in sampling one of China’s more impressive temples. Five-Pagoda Temple: This temple is renowned in China for being the only Indian style Chinese temple. It holds an amazing 1,500 frescoes of Buddha and is covered in Mongolian and Tibetan script. Inner Mongolia Museum: I am admittedly not a museum person, so I was surprised to find myself enjoying the eclectic collection of dinosaur fossils, ancient nomadic artifacts, exhibits showcasing local fauna and flora and even a section dedicated to Chinese space exploration! Walk around in the Old Town: Hohhot is a great place to simply wander around. A portion of Tongdao Road, also referred to as ‘Islam style street’ on TripAdvisor, boasts beautiful Muslim architecture and some really tasty Halal restaurants. Genghis Kahn Mausoleum: The world famous Mongolian hero’s mausoleum is close to the city of Ordos, 115 km from Baotou. History buffs love the mausoleum whilst others argue it is not worth the long trip. The mausoleum can be reached by bus from Baotou. Wudangzhao Monastery: One of the most impressive Tibetan Buddhist lamaseries outside of Tibet, this destination is fairly off the beaten track. Monks are very friendly but not many of them speak English. The monastery is approximately 70 km Northeast of Baotou. Xilamuren grasslands: Closest to Hohhot (90 Km) and the first grasslands to be developed as a tourist attraction, these tend to be overcrowded and packed with tourist buses in peak seasons. More worryingly, over-grazing and tourism in recent years have affected the grass leaving it sparse and browning in certain areas. Although these grasslands are host to a number of activities such as horseriding, I would recommend avoiding them if you have other options. Gegentala grasslands: These grasslands are roughly a two and a half hour drive from Hohhot. Although they are not yet showing signs of desertification like Xilamuren, they remain equally as tourist-oriented. Gengentala is home to rows and rows of yurts serving as accommodation. They do have the plus side of being equipped with modern comforts such as toilets and as they cater to the Chinese tourist you will even find a nightclub or two! 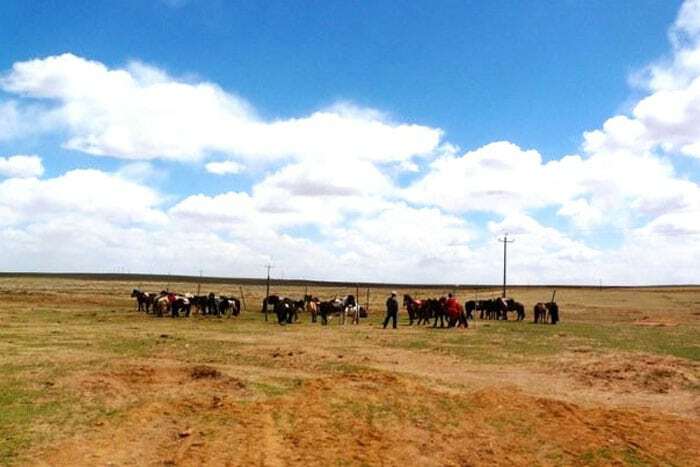 That being said, Gegentala is a good option for those who cannot travel too far outside of Hohhot and offers a range of activities from horseriding to wrestling to traditional mutton banquets held in yurts. Huitengxile grasslands: If you have a bit more time, these grasslands lay a three and a half hour drive from Hohhot. There you will find a very similar set up as Gegentala in terms of accommodation and activities, but less busy. Be warned however that some travelers complain the grass here is not as lush and green as they had hoped. If you want to visit one of the most beautiful grasslands in China, this is the place. This is where you experience luxuriant green plains, crystal blue lakes, roaming horses and all those things you imagine Mongolia to be. Found in Northeastern Inner Mongolia, Hulunbuir is over 2,000 km from Hohhot so more of a mission to access. The closest airport is Hailaer, only 7 km from Hulunbuir. A flight from Hohhot takes just over two hours. The closest train station is also Hailaer station. You can get a sleeper train from Hohhot for a tenth of the price of a flight but it will take you 40 hours. It is actually faster to get a train from Beijing (30 hours) so you may consider doing this if you want to visit this area specifically. In Hulunbuir, you will find similar tourist activities as in the other grasslands but will also have opportunities to discover the environment in a more intimate way. Hire a local driver, get involved in a horse-riding tour that spans over several days or simply go hiking. There is so much to do here! It is quite hard to find information on activities here beyond the organized tours that leave from Beijing so I recommend reading TripAdvisor or Lonely Planet forums for other traveler tips or simply waiting till you get there to plan your time there. 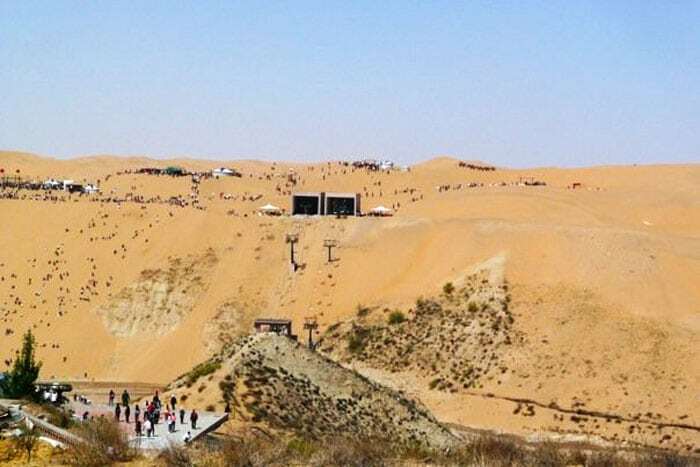 The Resonant Sand Gorge, known in Chinese as Xiang Sha Wan is an area of the Kubuqi Desert about one hour’s drive from Baotou. It gets its name from the reported ‘singing sands’ that can be heard there, making a noise some describe as similar to that of an airplane. However, travelers remain divided on whether such a noise can actually be heard there. Personally, I heard nothing. The Resonant Sand Gorge has become increasingly popular in recent years and has been developed to cater specifically to tourists. Think camel rides, dune buggies, sand sleds and a plethora of other sand-based activities. Despite the undeniably touristy aspect of this experience, the scenery is admittedly still breathtaking and the rides are actually good fun. For someone who had never experienced a desert (such as myself), this is still a great experience. Try the sand sled: it is one of the cheaper activities and sledding down the sand dunes is more exhilarating than any roller coaster! The camel riding is one of the more expensive activities (around 180 Yuan for one hour) but will enable you to see more of the desert. Before paying for an activity, find out how much time it lasts. Some are very expensive and only last 5 minutes! These deserts can be found to the West of Inner Mongolia and are much more difficult to access from Baotou or Hohhot. They almost warrant a trip in themselves, as they are more remote and difficult to organize travel in. Access from: Jinchang (in Gansu Province). How much does a trip to Inner Mongolia cost? Unless traveling to more distant locations such as Hulubuir or Badain Jaran desert, most travelers will start their trip in Hohhot. By flight: Flights from Beijing to Hohhot’s Baita International Airport take around 45 minutes with Air China, China Southern and China Eastern all flying this route. The airport is 15 km from the city center. The airport bus costs 5 Yuan while a taxi to the center costs around 30 Yuan. By train: A train from Beijing to Hohhot takes between 6 ½ and 11 hours and costs about 150 Yuan for a hard sleeper. Click here to read our complete guide for traveling in China by train. By bus: The long-distance bus from Beijing Liuliqiao Station (A1, Liuliqiao Nan Li, Fengtai District) to Hohhot takes 8 hours and costs 150 Yuan. Find out more about how to get to Hohhot here. Traveling to Baotou? Read this excellent article on how to get there. The easiest way to travel between cities in Inner Mongolia is by bus. Some travelers also choose to hire a driver to get to Inner Mongolia’s main attractions. Most hotels or hostels should be able to help you do this. It is also possible to travel by train between Hohhot and Baotou. The journey takes one hour and twenty minutes and costs about 25 Yuan on a hard seat. Accommodation options in Hohhot and Baotou are largely made up of hotels. Besides Anda’s Guesthouse in Hohhot, there is little in the way of hostels in these cities. For more budget options check Lonely Planet’s budget hotel section or, again, Agoda.com. Accommodation choices for more remote areas will be limited so be sure to check ahead for availability. The table below gives you an idea of the price of some of Inner Mongolia’s top sites and activities. Be aware that the prices are subject to change as these have already increased dramatically in recent years. Inner Mongolia can get very cold in the winter and travel plans can be affected by snow or blizzards so avoid this period if you can help it. It is widely accepted that the best time to visit Inner Mongolia is in the summer between May and August. Visit in July if you wish to witness the region’s Naadam festival commemorating the 1921 Mongolian revolution. During this time athletes will compete in wrestling, archery and horse racing in grasslands across the region. The region’s proximity to the desert means it can be very warm during the day but become very cold at night and in the early morning. Bring a good mix of clothing for this range of temperatures. You will experience a lot of direct sunlight in Inner Mongolia’s vast expanses so don’t forget sunscreen, sunglasses, a hat and some lip balm as it can get very dry! Lastly, a good pair of trainers will go a long way in your grassland and desert adventures. Mongolian families will present guests with a hada (piece of silk) and sing a song of blessing as a sign of welcome. It is tradition to accept the hada with both hands and to thank the host by crossing your arms across your chest. 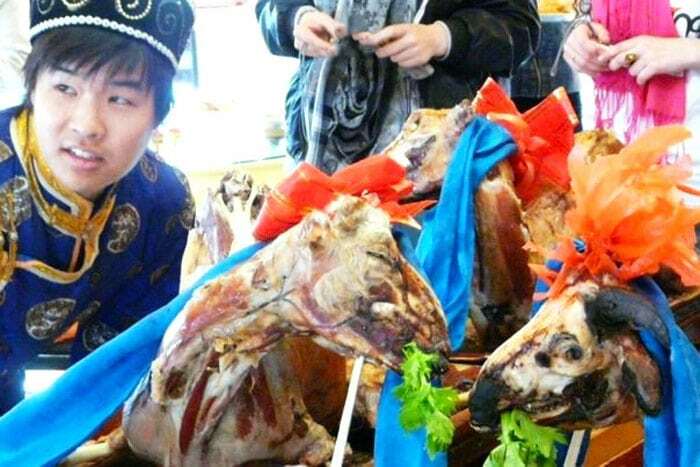 Be prepared to eat A LOT of mutton in Inner Mongolia. Some typical dishes to try: Roasted whole sheep, Roasted gigot, Mutton hotpot and Handlebar mutton. Want a break from all the mutton? Try these delicious buckwheat noodles in Hohhot. In terms of drinks, the salty milk tea is a definite staple. Or try the local beer Xai Bei. For some good old-fashioned souvenir shopping try Lao Jie (Old Street) in Hohhot. Some traditional Mongolian souvenirs include Mongolian silverware, Mongolian carpets, Mongolian knives with a sculpted blade, ox horn handicrafts and cashmere. Are you ready to travel to Inner Mongolia? If you have any questions just leave a comment below! Marie is a French girl who has lived all over the U.K. and the U.S. before somehow settling down in Beijing. Her main job is to inspire people to come and experience China through internships or volunteering. She loves traveling, margaritas and learning Mandarin slang. She has embarked on a lifelong quest to sample China’s tastiest eggplant dish. If I can ride horseback and see wild hose in landscape in March? Hi, thanks for the article. I am planning a trip to Ordos in Jul with the spouse and am trying to decide whether to go independently or with a travel agency. Our plan is to spend just 2 days here, making a day trip to Resonant Sand Bay and exploring Kangbashi the rest of the time. Our base would be a hotel in downtown Kangbashi. Could I find out how practical it is to hire a taxi on the spot to bring us around for the 2 days and how much that might cost? How easy is it to spend a few days walking/riding in the grasslands and staying in yurts. Is it easy to organise there? Ideally I would like to avoid a tour group. Hello William, your questions are quite general. I think we kind of cover them in the article! Hi, thank you so much for a great and informative article! I’m planning on visiting the Hulunbuir grasslands in August for roughly 3-4 days and I wanted to know if we’d need the tick-borne encephalitis vaccination? Websites recommend it for people staying more than a month, or for short-term travellers who will be mainly outside (camping, hiking etc.) but if we’re just planning a homestay in yurts and some horse-riding, do you think we’d need it? Do you know of any other vaccinations we must get or should consider getting? Thanks in advance! Hello Viola, sorry, we aren’t doctors. I am planning to go in July but will be visiting Heilongjiang before heading over. May I know how I can arrange for a local guide or private tour? And is it safe as I am a female traveler alone. please read our articles about tours in China. China is relatively safe. You should look for a local travel agency that offer this kind of tours, the problem is that Inner Mongolia isn’t a popular touristic destination among international travelers so it might be a bit hard to join group tours. Is it possible to have contacts for local driver, local guide, and more detailed tips on how to do a 1-week family trip there? Thinking of visiting Inner Mongolia very soon. Thank you so much for your insight and helpful tips. Very useful and very much appreciate your time and effort. Thank you very much Marie. Great info for me. I am going to Inner Mongolia in June..
Great info. thank you so much..
like your article. i’m a local Mongolian, starting to create my own travel website of Inner Mongolia, hope to get your opinion. Hi, I am Evelyn Tan H N, a retired English Language Teacher from Singapore. Lately, I am interested to know more about Inner Mongolia. Especially to find out more about the whereabouts of the 1st batch of children members of the Rainbow Hulu Bluir Children’s Choir which was formed in December 2006 by a couple who is very famous in the Performing of Mongolian Cultural dance and singing aspect. (+65 87819894 Republic Of Singapore). 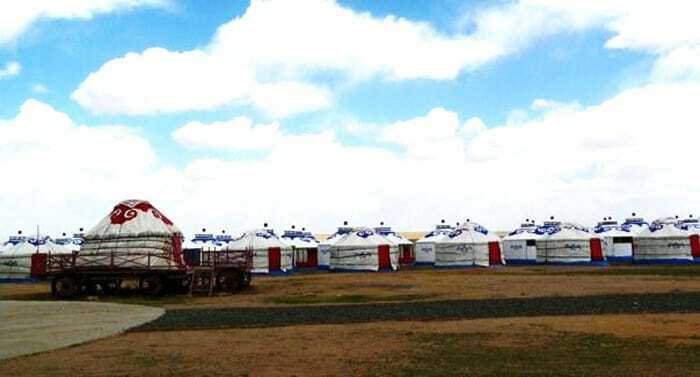 I would like to travel to Hulun Buir grasslands, stay in local yurt overnight, not big touristy type. I would also like to travel to Evenki reindeer herders and stay with them about 2 nights. Is this possible? I will be travelling in early December, and yes I do realise it will be very cold. I have done a lot of travelling in China, in winter, so I do realise how cold it will be. I can only find very limited information about the Evenki. Hi! Do you suppose it’s possible to get a car from the Singing Sands Desert to Hohhot? I’m thinking about doing the desert in one day, then leaving early the next morning for Hohhot, seeing the old street, and then catching a train back to Beijing in the afternoon. How much do you suppose the car ought to be?